Looked nice along with smaller size. Beautiful in set of 3. The Glittery Mountain Spruce Kissing Ball is a mixed branch decoration with glittered tips for added sparkle. 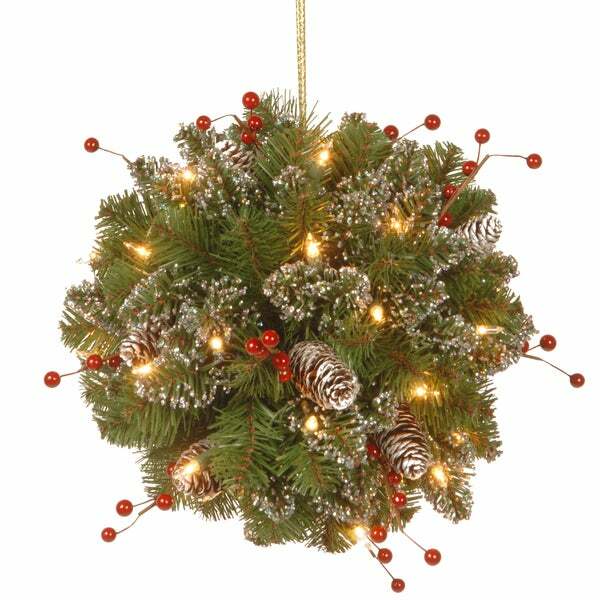 It is trimmed with white-tipped pine cones and red berries, and is pre-strung with 35 battery-operated warm white LED lights that are energy-efficient and long lasting. 6 hours ON/18 hours OFF timed operation. Hang this unique holiday decoration in indoor or covered outdoor locations. This kissing ball is the perfect addition to all of our outdoor Christmas decorations/lights. Technically you are not supposed to have it outside (without it being sheltered/covered), but I have had no issues with it thus far. It is very pretty! Very pretty. Looks amazing when lit. A perfect addition to your holiday decorations. I have had other kissing balls but this one is nicer and made well. I didn’t know what to expect with this, but it is super large and full! So nice! It hangs in one of our entry eats and looks amazing! The lights are bright and the pine cones and decorations in it look so nice! Great outside decoration. The battery operated light timer works perfectly and was easy to setup. This is a very beautiful, realistic-looking kissing ball. I had it outside at our front porch for a holiday party. It was a big hit with the couples, plus it looks great! This is such a beautifully decorated plant for indoor use! I put it in a pot next to my live plants and when it lights up, it adds a festive mood. I probably will keep it up past Christmas and throughout the winter. This spruce ball is very pretty in person. I don't mind the glitter because it enhances the ball at a distance. Personally I wish it had more lights. You will also need to shape it right out of the box. This kissing ball exceeded expectations. The lighting is subtle but beautiful. Love it the only complaint is the glitter. Otherwise it is simply beautiful!! !